****** If this all looks a bit complicated, don't worry! Try watching the videos at the bottom of the page.... it might make more sense after that! Black=Total production of electricity. Brown=Coal, nuclear and gas generation. Green=Wind and hydro power. Blue=Sea cable links to France, Netherlands and ireland. The daily peak (black circle) in the Past day chart (from February 2014) on the left at about 5.30 pm, which is about 7GW (equal to 7 million old style one bar fires) above the consumption in the middle of the day. 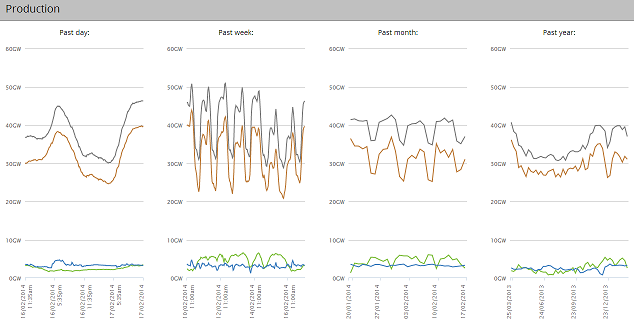 You can also see a real time National Grid chart on Kate Morley's excellent pictorial representation of their data. 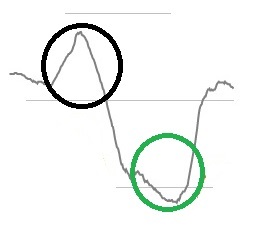 The trough in demand (green circle) of 30GW at about 5am on Monday morning – intelligent plugs would help to fill it by switching appropriate appliances on during the trough. Trough filling makes it easier for intermittent renewable sources to be used in greater amounts, particularly PV in summer. The peak in the Past week chart is different on each day of the week- the chart starts and ends at midday on Monday. As well as requiring more power stations, the peakiness of demand makes it expensive to run gas fired power stations, which are relied on to provide very wide and fast changing output, at low overall load factors. This will become a more acute problem as the levels of renewables grow - unless we shift our time of use! The National Grid believes that with the present system only 10GW of PV can be accommodated, largely because of the high solar output on summer mornings when demand nationally is low. Trough filling will be vital to increase this figure. Western Power Distribution (WPD) are responsible for local transmission lines and substations in large parts of the UK. They are saying that high concentrations of PV in suburban areas are putting strain on the transmission system. Ian Holyoak, renewable energy specialist at Michelmores in Exeter, clarifies WPD's concerns.